In October 1927, just prior to the introduction of the Model A, Sheeler was commissioned to photograph Ford Motor Company's River Rouge plant near Dearborn, Michigan. By then a noted commercial photographer and a moderately successful painter, he spent six weeks making photographs to be published in advertisements for Ford's innovative products. These images would be exhibited also as fine-art photography, and many of them served as sources for a group of paintings, including Worcester's City Interior, that Sheeler executed during the mid-1930s. 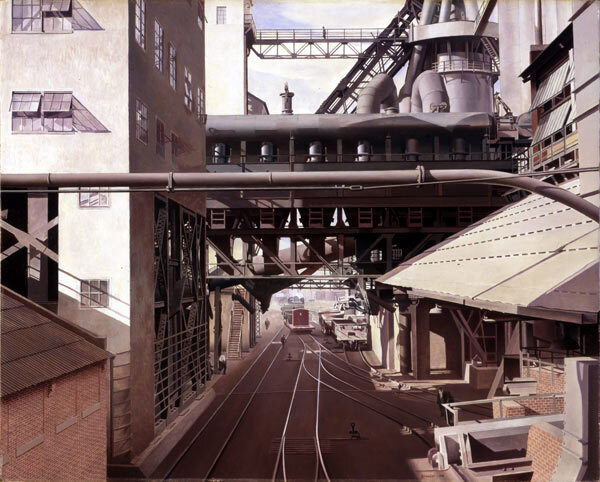 As his River Rouge photographs and paintings attest, Sheeler was impressed with the magnitude of the factory complex as well as with its design and technology. City Interior- developed from a gouache study in the Museum's collection (acc. no. 1977.143)- depicts, on the left, a sintering (heating) plant and, on the right, a blast furnace where slag was channeled through a pipe into buggies to be carted away. Emphasizing the visual rhythms created by the web of pipes and railroad tracks and by the repeated rectilinear elements of windows and steel girders, Sheeler imbued the architecture with a lively, organic energy. Giving no hint of the grime or pollution in factories, the painting idealizes the automotive industry and its role in the progress of technology.